Has it been forever since you looked and felt amazing? Are you wondering how to get back there? Have you tried other exercise approaches and didn’t receive the desired results? Come to A Beautiful SurpriZe Pilates studio and learn how to move with ease, lose the excess body fat, increase stamina and create the body of your dreams. Our group classes are a safe place to be. Limited to 6 people, they provide the atmosphere of camaraderie and community where you will feel encouraged and supported. Group classes are taught using Reformers, Wunda Chairs, Barre and other props. We offer Pilates Reformer, Barre and Fusion classes that are fun and will never leave you feeling bored. At A Beautiful SurpriZe studio we create an environment that is free of judgement, and full of encouragement so that you can feel safe and motivated to live a healthier lifestyle. A Beautiful SurpriZe is a boutique Wellness Studio located in Herriman, Utah. We specialize in Pilates and The Rossiter System to help our clients rid pain and finally achieve their dream body. Our beautiful studio was designed to create an atmosphere where people love to be, and look forward to returning. We feature Balanced Body Allegro 2 Reformers to sculpt and shape bodies and lives. Our goal is to teach you to take the time to take care of yourself and know that you deserve a better, happier, and healthier you. Most people don’t realize how good they really can feel and I’m here to show you. I have been teaching for 16 years and am committed to helping others feel and look their best. I am a Pilates teacher but I am also a “real” person. Since my first baby I have gained 100 lbs, 80 lbs, and 60 lbs. Staying in shape is genetically a challenge for me but I have walked the walk and learned many lessons along the way. Step into the studio and you will feel excited about the workouts and the changes that you will see in your body. Your will experience continuous progression of the workouts so that you never feel bored. For every hour that I teach I spend more than that on continuing education and program design so that YOU get the best results. I love what I do, let me show you why. Learn to move in a way that tones your body and prevents injury. You will strength-train both small and big muscles to shape the body while rehabbing any current injuries that you might have. Our Barre classes are for all levels from experienced prima ballerinas to those navigating your first session. 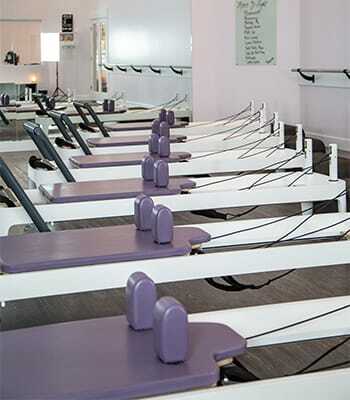 You will utilize Reformer during the hour as well to enhance your work at the Barre. Alleviate pain and gain mobility by creating the proper amount of space in the connective tissue. We guarantee you’ll leave better than you came in, or no charge. Register for a beginners class if you have not taken Pilates before or feel you need a refresher.